Sales coaching is not a one-and-done event, especially when it comes to mastering social selling! 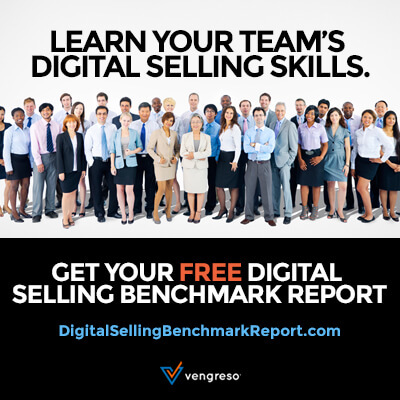 Though digital prospecting may seem straightforward, it requires behavior change, reinforcement, and ongoing training. A half- or full-day social selling training session simply isn’t enough. Mario Martinez Jr. says you’re better off saving your money if that’s all you plan to do to mobilize your sales team as social sellers. In his conversation with Bernie Borges, CMO of Vengreso, Mario explains why you need the right “gear” first. Watch the video or keep reading to hear what the gear is, and why simplifying digital selling for your salespeople is crucial. Fishing tackle should be at the top of your list when you’re planning a fishing trip. You need your rods, reels, bait, lures, a net, and maybe a boat. When it comes to social selling, the list of gear starts with a LinkedIn Profile that includes messaging to attract your targeted customers. You can tell your salespeople how to rewrite their LinkedIn Profiles, but how many will actually go out and do it? Vengreso’s team has seen dismal results with this approach. If you can prepare their profiles for them, as we do with our LinkedIn Makeovers, you’ll make it easy for them and even boost their confidence. The next item is bait – content that enables your sales team to reel in the big ones. Vengreso calls this type of content, Content for Sales. During the buying process, 82 percent of B2B buyers consume five to eight pieces of content from the vendor they choose. Once you’ve checked content off your list, ask yourself how you plan to deliver it to your salespeople. An advocacy tool will distribute the content and increase your brand’s reach too. Two possible advocacy options are Everyone Social or GaggleAMP. Be sure you go through the whole process to make your investment worthwhile. Don’t let your lines get tangled. Plan for ongoing sales coaching to keep your team prepared for their next catch. Learn more about attaining digital selling success in our webinar series, 4 Principles of Digital Selling Success. When you register, you’ll receive the previously recorded webinars. Sign up today!